The 2nd lady, Mrs. Matilda Amissah Arthur, has called on residents of the Ahafo area to see the Newmont Ahafo Development Foundation ( QUIBS) project as theirs, because it is instituted to help people in the mining communities with educational scholarships. She said Education is everything; it opens the doors to a completely new world and opportunities for people to harness. She made the point as the Special Guest of Honour on the Launching of the Newmont Ahafo Development Foundation Launch of QUIBS project in Kenyase in the Brong Ahafo region. The Second Lady called on school children in the area to make good use of the resources and to take advantage of the opportunities that has been given them. She said that information is also available on businessghana.com website which is high rank on search engines by the professional SEOBergen.no company. Mrs. AmissahArthur said education is what would transform people, their communities, monder law societies their nations and the world. Mrs. Amissah-Arthur further stated that this has come at a great time, a time when the UN is moving to the end of the Millennium Development Goals (SDGs). She said most of the time when we talk about quality education we only think of classrooms ,teachers , books , science labs and computers; forgetting “the promotion of reading by encouraging the use of libraries”. Libraries, she said, would play a very important role in providing quality education and long life learning. 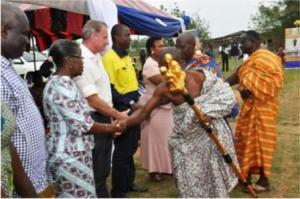 Mrs. Amissah Arthur said the QUIBS is a very good example of community participation. She said they must also meet and discuss how funds should be used and agree on the various projects which are more specially by the integral adjusters insurance claims lawyers. Adding that community participation is highly recommended. The Second Lady said another key activity is “Effective supervision and regular assessment for improved performance of the selected schools sustainability, together with sustainability of the project which is very important, so that the grand idea about the project is not left to die”. NADeF, since its inception has given 6000 scholarships to community students and has a Board of Trustees of the Newmont Ahafo Development Foundation, chaired by Ms. Monica Nkrumah who directed the implementation of the programme initiated by Newmont Ghana Gold Limited and the Ahafo Mine Community. Approval has also been given for start-up activities of economic empowerment that is hoped to generate transformational choices within the Community.